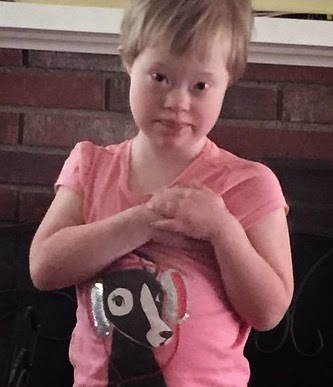 Celebrate World Down Syndrome Day by signing this petition for better health care for children and adults with Down syndrome. Down Syndrome OPTIONs is educating parents NOW to improve the health and development of our loved ones. Come join us and make a difference! to experience the event of the year! The conference (May 21-25) is $99, with two full days of Down Syndrome specific presentations (May 21-22) and five days of pertinent, helpful topics from the autism community like fermentation, homeopathy, healthy cooking, boosting immunity, supporting gut health and much, much more. That's a small price to pay for access to such great information! In addition to the life-changing information, you will meet up with parents, researchers and doctors in person. It will be an amazing experience you won't want to miss! I'm excited to meet you at the Down Syndrome OPTIONs booth. Please welcome guest blogger, Christine H., mom to beautiful, resilient, Olivia who has T21, as she openly and honestly shares her hits and misses in her quest to successfully help her child speak despite the additional diagnosis of apraxia. Our journey with apraxia really began when Olivia was about 18 months old. We saw a Speech Language Pathologist (SLP) for a consultation and she said that Olivia was showing signs of apraxia. Why? She was not babbling and could not imitate mouth movements at all. Olivia could imitate other gross motor movements, like body gestures, but not oral movements, such as puckering, blowing, etc. According to the National Institute on Deafness and Other Communication Disorders, apraxia is a speech disorder in which a person has trouble saying what he or she wants to say correctly and consistently. The severity of apraxia of speech can range from mild to severe. People with apraxia of speech may have a number of different speech characteristics or symptoms. One of the most notable symptoms is difficulty putting sounds and syllables together in the correct order to form words. Longer or more complex words are usually harder to say than shorter or simpler words. A person with apraxia of speech also tend to make inconsistent mistakes when speaking. For example, he may say a difficult word correctly but then have trouble repeating it, or he may be able to say a particular sound one day and have trouble with the same sound the next day. Someone with apraxia of speech often appear to be groping for the right sound or word, and may try saying a word several times before he says it correctly. Another common characteristic of apraxia of speech is the incorrect use of “prosody” — that is, the varying rhythms, stresses and inflections of speech that are used to help express meaning. Here is what I didn't know: According to Libby Kumin, speech expert in Down syndrome, about 30-40% of kids with Down syndrome also have apraxia. It is MUCH more than a speech delay. It is a speech DISORDER. If your child has apraxia, you can NOT compare their speech with typical kids with DS. And sadly, our kids with apraxia develop speech MUCH slower than other kids with DS, with the first words arriving at about age five. It doesn't mean they won't ever talk (although some kids don't, but it is rare! ), but just to expect it to be slow going. Apraxia is also VERY frustrating. One day she will say a word PERFECTLY and you think they have it down, the next day it is GONE! And the parent is thinking where did it go? It is part motor planning and part memory! For example, Olivia can say "bye" and "kuh", but she can not say "bike". So now that you know what it is (and you're thinking the future is bleak! ), I am here to tell you its not. First thing IF you suspect your child has apraxia, get a diagnosis by an SLP who knows what apraxia looks like. Believe it or not, a LOT of them don't! The treatment plan is different for our kids. If you suspect it, what should you be looking for, other than the signs above, of course? For starters, if your child is not babbling (mama, papa, dada, etc.) by the age of two and cannot imitate your pucker or blowing, then you should suspect it and get a diagnosis. Do NOT believe it when/if an SLP says that your child is just delayed because of the Down syndrome diagnosis! Next, you must get this book: Speaking of Apraxia: A Parents' Guide to Childhood Apraxia of Speech by Leslie Lindsay. And also this book: Early Communication Skills for Children with Down Syndrome: A Guide for Parents and Professionals (Topics in Down Syndrome) by Libby Kumin. On pages 125 - 126, Kumin lists the characteristics of apraxia in our kids. You must have these CD's: Talk It Rock It, in your car. They are music specifically designed to encourage your kids to talk. It is basically speech therapy in the car!!! I HIGHLY recommend Talk It Rock It's Imitation Station CD and "Animals Movin and Groovin". Make copies of them so you can play them at home too. If your child is age three or older, I highly recommend hippotherapy (a form of speech and other therapy in which a therapist uses the movements of a horse to provide carefully graded motor and sensory input). There is something about being on a horse that strengthens the core that is really beneficial for our kids. More details are Lindsay's Apraxia book. Learning sign language, while controversial in our community, has been a HUGE blessing. We started teaching it to Olivia when she was nine months old. She did her first sign at 18 months...it took awhile! BUT I am so glad I did! Without it we would have had huge behavior problems because she couldn't communicate and we don't have that. In addition, it is a wonderful way to help our children learn imitation. It was a nice bridge into the speech program that we chose to use with Olivia. I give Olivia a LOT of supplements too (except where indicated, see Andi's blog and the DS Day to Day amazon Store). As for therapy, you must have an SLP that is an expert in apraxia. A lot of people do PROMPT therapy. We tried it for about two or three months and did not have any success with it. Unless you have wonderful insurance (which we don't), it's an out of pocket expense, and at $150 an hour, that can quickly add up. I also found that it is not IMMEDIATELY able to duplicate. I know some people have had good success with it and I am happy for them, but it needs to be done frequently, which is costly, and it can take awhile...as in months. Honestly, I am not THAT patient! At the end of the week, Olivia was saying about five words. Are you kidding me? When we went there, the only word Olivia had was, "Hi!" Five words in a week!! I will take it!!! I was ecstatic, to say the least. Lynn teaches you how to do a program at home, so that is what we have been doing. I'm not as consistent as I would like, but we try to get the program in at least three or four times a week. It takes about 10 - 15 minutes. We have also done Talk Tools and Beckman Oral Motor therapy. Neither one of those methods produced actual speech for Olivia (probably because apraxia doesn't happen because of weakness or paralysis of the speech muscles [the muscles of the face, tongue and lips].) I do think these therapies helped to strengthen her lip muscles, but we actually never worked on speech sounds during these therapies (shocking, I know!). The only time Olivia worked on actual speech sounds was during the therapy sessions in Arizona. I still, however, do Talk Tools to strengthen her lip muscles and to get that tongue back into her mouth! We also work with some great apps on the iPad. We love all of these apps. Olivia probably likes Speech Box the best, but she likes all the other ones too. As for Olivia's story, we had a preliminary diagnosis of apraxia at 18 months due to no babbling and a fairly quiet child who was unable to imitate lip movements. As the years progressed, Olivia moved from mild apraxia to severe apraxia simply because she did not progress with speech at all. It wasn't until we learned the speech-ez program that Olivia had changes at the age of four! She is now almost five and is reading simple, "I see a ____" sentence books. She can say about twenty to thirty words with many more approximations. AND, here is the kicker: This girl is a leukemia patient. She has been on chemotherapy all of last year. We have both worked hard. I hope my story will help someone else whose child has apraxia. Thank you for sharing, Christine! I know your hard work and experience will save parents a lot of time (and money!). Wow. I can't believe it's been a YEAR since I wrote this blog post on our journey with apraxia. In a years time, Olivia has continued to become more vocal, particularly when reading, but even more vocal as a whole. She has been off of chemo since June, 2014, so this is also playing a role as she just feels BETTER. Olivia even had a five hour double knee surgery at the end of November 2014 that she had to recover from and still the speech gains are huge. In July, 2014, I started back with Beckman oral motor therapy because the tongue was REALLY coming out. I added Talk Tools in January of this year because I felt the combo of the two might be just right for Olivia to strengthen her mouth muscles. T, S, and R words. (Tuh, SSSS and RRR sounds and simple words for each letter.) When I focus on the letter sounds, I am also combining Speech-Ez with it. This double whammy seems to really be helping. Really long video session for long car rides with 82 different video clips - Olivia, duck, duck, goose (her favorite), names of her cousins and friends, W sound and want (really trying to get her to say this word correctly), D and M words and sounds and some other pre-school games. I also mixed in some humor to keep her from getting bored. When I hear her saying new words that are in the video in the car, my heart just melts. Conversation - I want (ball, bear, cup, food), I love you, Are you sick, Do you need help?, I don't know. I think Gemiini fits in perfectly with a neurodevelopmental program. When we were on NACD, they had me make videos and some of them are EXACTLY what is in Gemiini. The key with apraxia is repetition. They say that apraxia requires about three one-hour speech sessions a week. I can't afford that at $150 an hour. That's insane and we don't have good insurance. The school district MIGHT provide one hour a week. Maybe. It's still not enough. Gemiini fills the gap! It's not a replacement for her SLP or all the other things I am doing, it's in addition to. They have an iPad app, which doesn't require WiFi, so we download the sessions and can watch it in the car. We watch it at breakfast and lunch and probably one other time during the day, plus if we are out for over 10 minutes in the car. Olivia will often take the iPad and go right to the Gemiini app to watch it and practice saying words!! I would say Olivia can now say approximately 200 words; again mostly through reading. Her spontaneous language is now around 30 or so words. Her horse therapist commented to me today on how her articulation is REALLY improving (she said "yellow" perfectly clear when asked what color the beanbag was) and asked me what I have been doing. "Gemiini," was my reply. It's been a REALLY LONG time, since I have been excited about something, but I am super excited about this. I strongly believe this is going to be a deal changer for our kids! The math piece alone is unbelievable. They really made it visual. There are pieces on how to take a shower, how to interact with other kids, how to play with other kids, so so much there! Bottom line, YOU (or your SLP) can create what your child needs. I am constantly tweaking the videos to appeal to Olivia so that she keeps enjoying watching them. The day before my birthday in March, Olivia spontaneously said, "I love mommy" -- TWICE. I think I died. It was at that point that I knew I found something amazing for my child...for any child with a speech delay, really. I highly recommend you check it out. The pricing information is listed on their website. If you need financial help, don't hesitate to apply for it! And there's a Facebook group called Gemiini Secret Discussion Group you can join to ask questions and get support for the program.